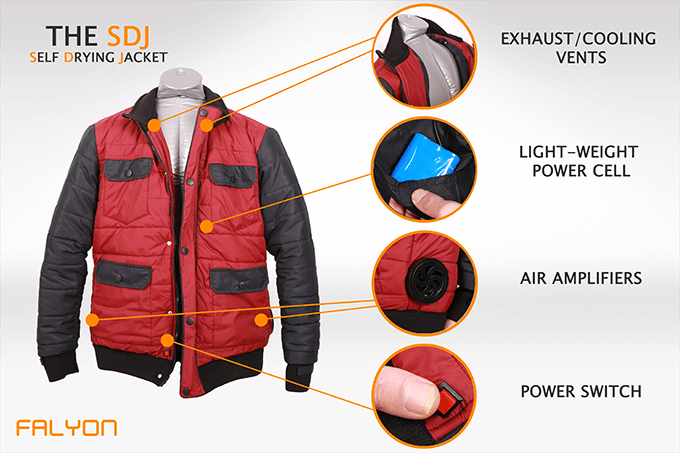 So Now You Can Buy A Self-Drying Jacket, You Know, Like On BTTF… | OhGizmo! By David Ponce on 12/18/15 • Leave a comment! It was Back to the Future Day not so long ago, and the entire Internet was talking about it. But we’ve moved on apparently, so perhaps news of The SDJ-01 by Falyon Wearable Tech is a little passé. The SDJ stands for Self Drying Jacket, and that’s exactly what this garment claims to be able to do. It integrates a battery and a blower fan that pressurizes the inside of the jacket and dries it from the inside out in a couple of minutes at the press of a button. Of course you could just get a jacket with a waterproof coating, but then you wouldn’t be able to tell people you have a Marty McFly-style self-drying jacket from the future. Apparently the batteries will provide up to 30 minutes of drying time, and the circulating vents near the neckline not only allow pressurized air to escape, they’ll provide the wearer with a gentle breeze that could prove pleasant when hot. It’s a $149 pledge with shipping in April 2016.